Hey everyone! I'm back. I had a great time with my parents, but of course I'm sad they've left now :(. I want to revisit a Sinful Colors oldie polish for you today, but I'm pretty sure this is part of core line so you can still find it! This is one of the first polishes I purchased when I first started to really get into my nail polish. This was actually one of my first favorites too, but it definitely got overshadowed at time. I decided to revisit it recently, and my love for it came back again! Forget Now is a magenta pink base with violet/blue glass fleck shimmer throughout. Welcome back! I've always felt Sinfuls color names have nothing to do with the color and they just kind of slapped a label on the bottle, lol. 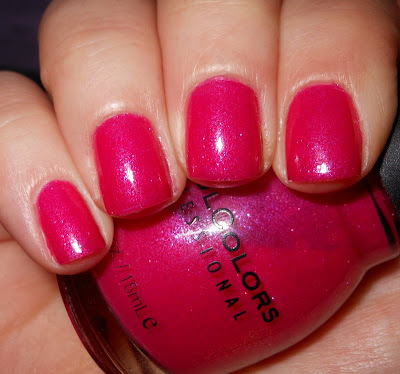 But this is a great pink and so affordable!